When I was very young growing up in Texas, I had one of those white plastic toy cameras (pictured above) with a rotating flash cube. It was my favorite possession back in the day. I took imaginary pictures of everything in sight. 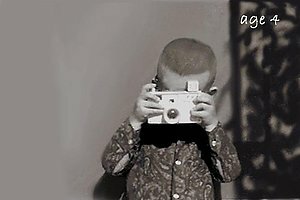 Later on, my parents bought me a Kodak 110, a Polaroid SX70 Alpha, and a few others. 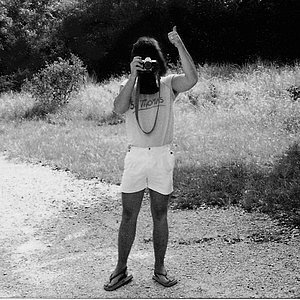 In 1992, my Father gave me his vintage 1974 Pentax, Spotmatic 35mm...what a great camera! Today, it's painfully manual after using my higher-end SLR's but I must say, I've produced some great images with it. It forced me to learn how to create my own exposure preferences and experience the satisfaction that this brings to the art. Photography is not my only passion. I'm a husband, father of two, a brother, an uncle, and a son. I'm the President of a marketing company and have had the pleasure of working side by side with my father, sister, and other great people over the years, building our company and great memories. Marketing and photography are similar in the sense -they never stop evolving. They both require hard work, ambition, and a lot of passion. Studio and portaiture has become an important part of my photography ambitions and yields great rewards for the one who shapes light. The peacefull rest of a sleeping baby, the innocence of a young child, the ambition of a senior, and the grace of a beautiful model, all bring unique challenges to every session. As an up and coming portrait artist, I handcraft every image from the session until my goals for the image have been achieved and at that point, I know the client will be pleased. A big thank you to David Miques with ATX Photography for inviting me into his studio, allowing me to learn, and giving me room to work & breath. Wedding photography is different but the rewards are similar! It's probably the most important style of photography we do because it means so much to so many for so many years, and for many generations too. It's a pleasure to be in one place with so many happy people celebrating together! Capturing those special moments on this special day is challenging but after a succesful wedding as a photographer, to me - it's like winning a heavywieght championship fight. Landscape photography is fun and I really enjoy capturing the beauty of our beautiful planet! It's not easy getting up at 4:am to get yourself and your gear in position for the sunrise -but that's where you'll find the color and contrast needed for an appealing image. I'll never forget the natural color produced by the sunrise over the Utah desert, the ageless monuments of Rome, or the great depth of the Canadian Rockies at sunset. I'm hopeful I'll be able to continue traveling and eventually find that one shot I always seem to be looking for. It's always there -the trick is, knowing when you see it. All of the above wouldn't be possible without the support of my beautiful wife JoJo! She's allowed me to move freely and do what it takes to reach my goals in business, photography, and happiness. I love you so much! Thanks for your time and the visit. I hope you enjoy my website and please take a moment to drop me a line.